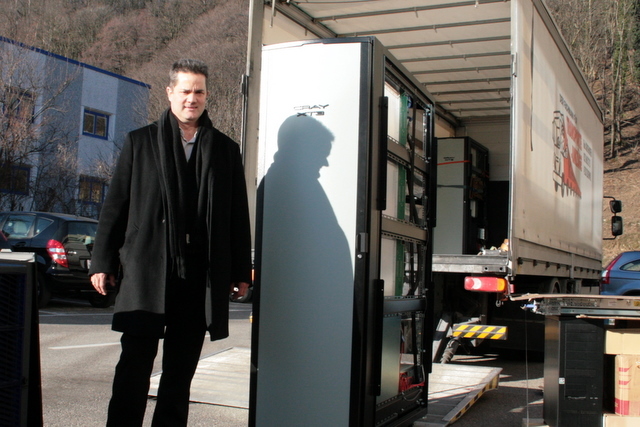 In a previous blog entry we reported about the Cray XT3, Palu, being decommissioned at CSCS. In the meantime we were able to give a new home to the three of the six computing racks at ENTER, the Museum for Computer and Technology close to Solothurn. Das ENTER ist das einzige Museum in der Schweiz, welches sich der gesamten Breite der Computer, Computerperipherie und Technik widmet. Vermutlich weltweit einzigartig ist die Anzahl noch funktionierender Computersysteme. Nebst den ca. 400 Computern werden auch 100 Taschenrechner, ca. 50 mechanische Rechenmaschinen, Telekommunikation vom Telegrafen, Zentralen über die Telefonie bis zum modernen Handy, Röhrenradios, Röhrenfernsehgeräte, Chiffriermaschinen und vieles andere gezeigt. It is a good feeling to know that computing systems running once at CSCS can be viewed by the generations of people. The Cray XT3 was an important step for CSCS being the first massively parallel MIMD supercomputer used at CSCS. Palu was used both by researchers of Swiss universities and by MeteoSwiss for weather forecasts. In the next photos you may see some steps of the shipping of the three racks (each with a weight of about 830 kg). In addition a SGI Origin 9500 has also been donated to the museum. The console of the Cray XT3 and an additional rack are loaded in the computer room for transport.